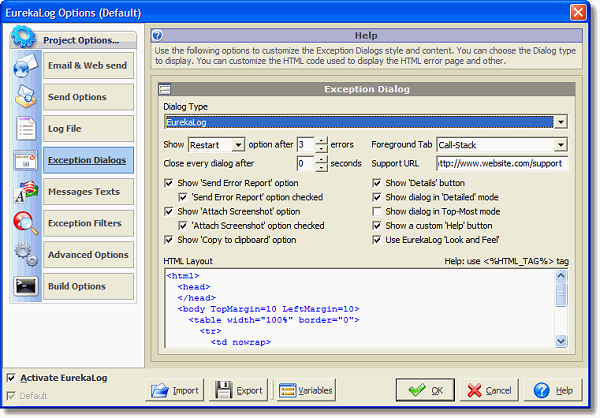 In this section you may customize the Exception Dialog (or HTML error page for the Web application). You can choose to Terminate or Restart the application after a specified number of exceptions. You can indicate which Tab, General, Call-Stack, Modules, Processes, Assembler or CPU, should be presented in the foreground when an exception is presented on screen. You can choose to close every Exception Dialog after a specified number of seconds that the dialog is unused. You can set this option to display in the Exception Dialog a specified Internet link (URL). A custom HTML code used to show the HTML error page (Web application only). Use the <%HTML_TAG%> to indicate where the error message will be show.